MELVILLE, N.Y., August 22, 2017 – Packing even more features in a small package, Canon U.S.A. Inc., a leader in digital imaging solutions, announced today five new PIXMA TS-series Wireless Inkjet All-In-One (AIO) printers. The PIXMA TS9120, TS8120, TS6120, TS5120 and TS3120 Printers deliver a host of new features, while maintaining the sleek, compact body and versatile print, copy and scan functionalities of their predecessors. Each new model is equipped with a high-quality ink system, Bluetooth®2 connectivity for wireless printing and scanning, and the new, interactive Message in Print app3, soon to be available for users of compatible iOS devices in the fall of 2017. These new models are the ideal tools for tech gadget lovers, creative crafters and image makers to print and scan their creations in the most beautiful fashion. 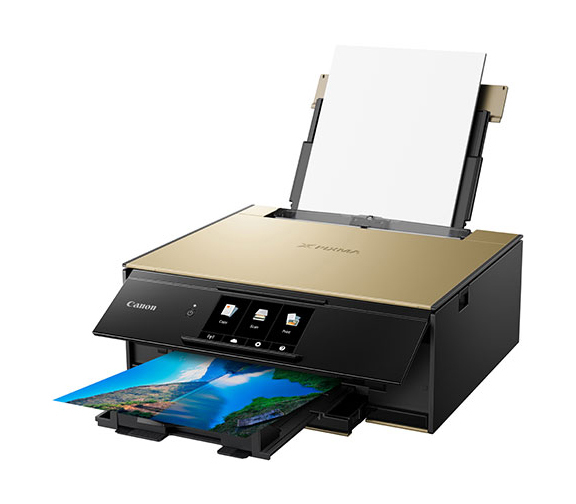 Bluetooth connectivity, allowing users of compatible mobile devices to print and scan wirelessly from the new printers with ease using the Canon Print App; improving the overall user experience. Attractive new colors are available throughout the lineup that will further enhance the room’s interior. The PIXMA TS9120 is available in a sleek gray, gold or red. The PIXMA TS8120 is available in black, white or red. The PIXMA TS6120 and PIXMA TS5120 are available in black or white and the PIXMA TS3120 is \\$79.99 MSRP and available in white. The PIXMA TS9120 Wireless Inkjet All-In-One Printer is $199.99 MSRP and the PIXMA TS8120 Wireless Inkjet All-In-One Printer is $179.99 MSRP.The PIXMA TS6120 Wireless Inkjet All-In-One Printer is $149.99 MSRP,the PIXMA TS5120 Wireless Inkjet All-In-One Printer is $99.99 MSRP and the PIXMA TS3120 Wireless Inkjet All-In-One Printer is $79.99 MSRP and available in white.